German artist Harald Geisler (b. 1980) is looking closely at the handwriting of German monk and Protestant revolutionary Martin Luther (1483-1546), making writing from 500 years ago come alive again for popular use – as a handwriting font. A font, such as Times New Roman, Helvetica or Cambria, is a software that formats letters for computers and other digital devices, like the screen of a smart phone. Organic food labels and Starbucks napkins, for example, show how fonts modelled on handwriting have become increasingly popular in the last five years, giving a personal touch to the realm of advertising and commercial packaging. Geisler has become a specialist in this field of digital handwriting—not making handwritten corporate signatures, but rather taking on the more noble project of inventing type that challenges people to think. Using the crowd-funding platform Kickstarter, he tries to reach as many “normal” people as possible with his projects. Geisler’s atelier in Frankfurt is full of images of people and historic documents: the equations of Albert Einstein, a portrait of Martin Luther, and a whiteboard with a list of names and deadlines. On the hallway outside there are prints showing his projects outside of font design: pictures of dried flowers and images showing words made out of keyboard keys. Rather than perfect a script to be smooth and readable, taking away personal touches and any link to the original author, Geisler likes the deeper work of meticulously studying the real handwriting of important historical figures, though documents in libraries and high resolution scans in online archives. This work is always a balancing act, between upholding the truth and rigour required to document an actual writing style, with aesthetic decisions about eccentricities and imperfection that are the signature of real handwriting. Geisler focuses on the nuances of getting that interpretation as close to reality as possible, and describing to a public how he goes about, making those aesthetic decisions. After a tipoff from a friend studying to be a priest, Geisler took as his inspiration the impact of Martin Luther’s 95 Thesis, which had its five hundred year anniversary. Geisler is currently reviewing a historic document penned by Luther’s in 1521 to make a meticulous font, true to the twists and curves of Martin Luther’s actual handwriting at that time. Though Martin Luther’s letters are quite easy to capture, it is the transitions that are difficult he notes: showing a style of handwriting that wasn’t programmed by speed and efficiency, like Geisler assumes modern day handwriting has been habituated. Part historian, part philosopher and part designer, Geisler is really curious about how handwriting has evolved in different countries and epochs, and how words get penned, monumentally or privately, with strokes that become a rhythm of life. Like a fingerprint, is one’s handwriting purely unique? Or, is it true what handwriting analysis suggests, that those curves are a window into your soul? Geisler points out, handwriting is also just a practical way that people scratch ideas onto paper. Geisler likes the connection he acquires by studying the handwriting movement of another, getting a sense of their rhythm and flow, and the urgency or lightness with which they write. Each letter or document captures a moment in a person’s writing history. The font, like a portrait, documents a person’s writing at a specific moment. Respectful to his handwriting host, Martin Luther, Geisler does not foreground religion in his discussion of the project. At best, he hopes it will inspire people to a closer look at the critical tradition of religion that Martin Luther fostered. Geisler’s excitement stems, more generally, from the novelty of studying handwriting from so far back in history. He likes the surprising “twists” and “turns” he finds there—such as a loop of the letter h, which is at the bottom rather than in the middle of the letter, as in contemporary times. Geisler is already thinking ahead to his next project: the Martin Luther King Jr. Handwriting font. Like the game that he plays with digitising handwriting, Geisler is interested in what it means to be a copy of something else—like a person holding the Jr. name carries. Also, 2018 is the fifty-year anniversary of King’s assassination. 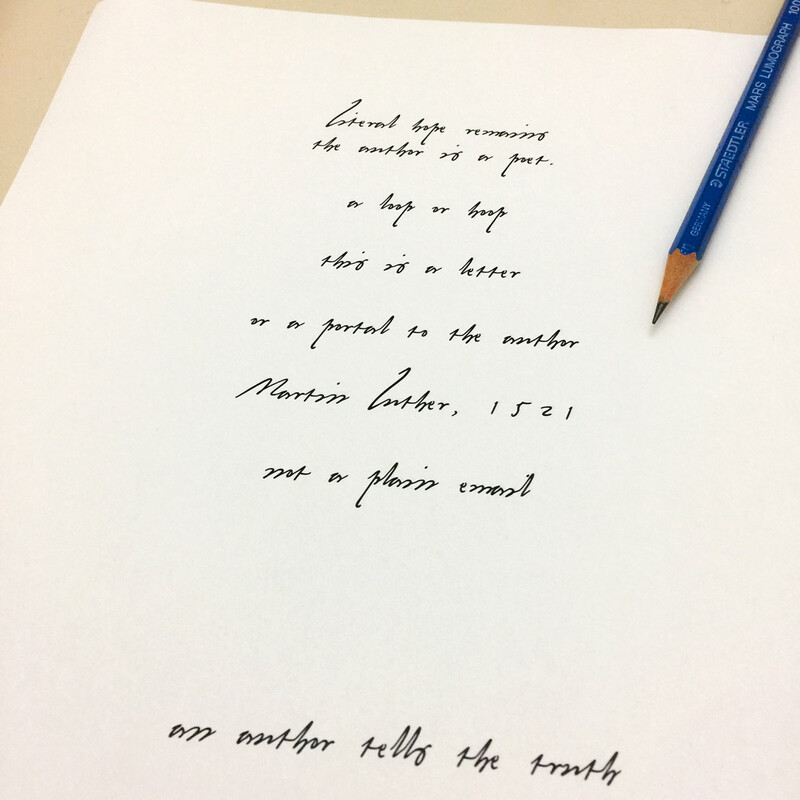 To commemorate him, Geisler will link the Martin Luther font, with a Martin Luther King Jr. creation: a duo that will celebrate 500 years since Luther’s thesis and 50 years since the death of this important minister and activist. Geisler has gained quite a following in the last years with his innovative font design, having invented already the Albert Einstein font (2015) and the Sigmund Freud typeface (2013), and even reproduced a letter exchange between the two (2017) on the topic of war. Through the international crowdfunding platform Kickstarter over thousands of people have purchased Geisler’s fonts for a variety of purposes: for formatting texts, T-shirt designs, book titles and postcards, as well as simply for private use. More than just making commercial products, Geisler is interested in sharing stories and proper artistic documentation of his work, also helping people read actual documents from the authors, and reflect on the philosophical questions, like: what does it mean, to reproduce your ideas, in the handwriting or “hand” of another person? The current Martin Luther Kickstarter campaign runs until the 27th of December 2017, and allows for people to pre order the font for 10€. A prototype of the font can be downloaded through the Kickstarter site, prior to backing. Feel free to use any of these images, videos and animation GIFs when writing about the Martin Luther font project. Feel free to resize and crop them according to your needs. Please credit all media with Harald Geisler — Thank you. Below you see what the using the prototype on screen looks like. Please keep in mind that the prototype currently only contains the letters: M a r t i n u s L h e r o p l – a couple of numbers, comma and period. So the expressions are limited. Of course the final font will have a full set of characters supporting all european languages. 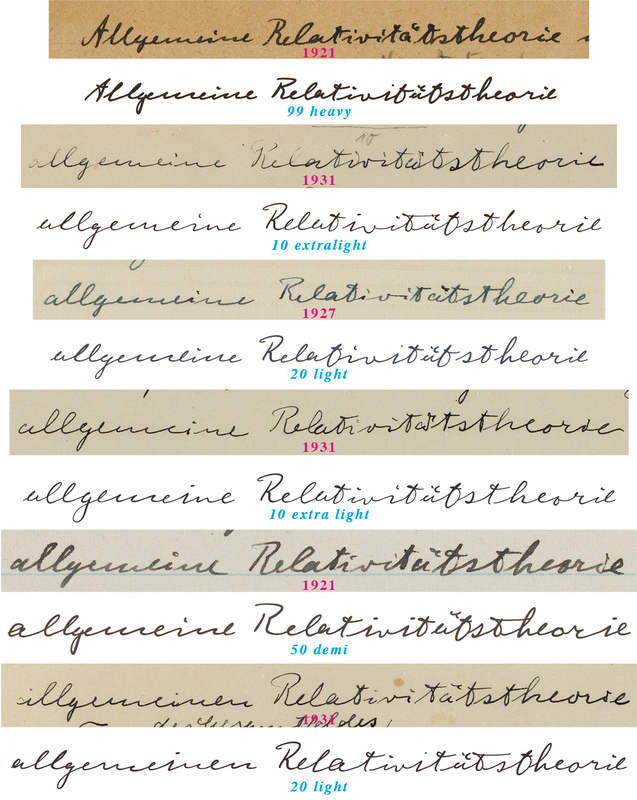 ↑(300 dpi) Albert Einstein Font, original handwritten samples compared with font. Harald Geisler is a German designer with a degree in typography. His latest font design, the Sigmund Freud Typeface, became the first typeface to be featured in the Wall Street Journal. He is also the publisher of the recent reissue of the Swiss design classic “Designing Programms” by Karl Gerstner, with Lars Müller Publishers Zürich. Geisler’s projects range from font design, to book and app publishing, still life flower prints and calendars. His typographic studio is located in Frankfurt am Main, Germany. 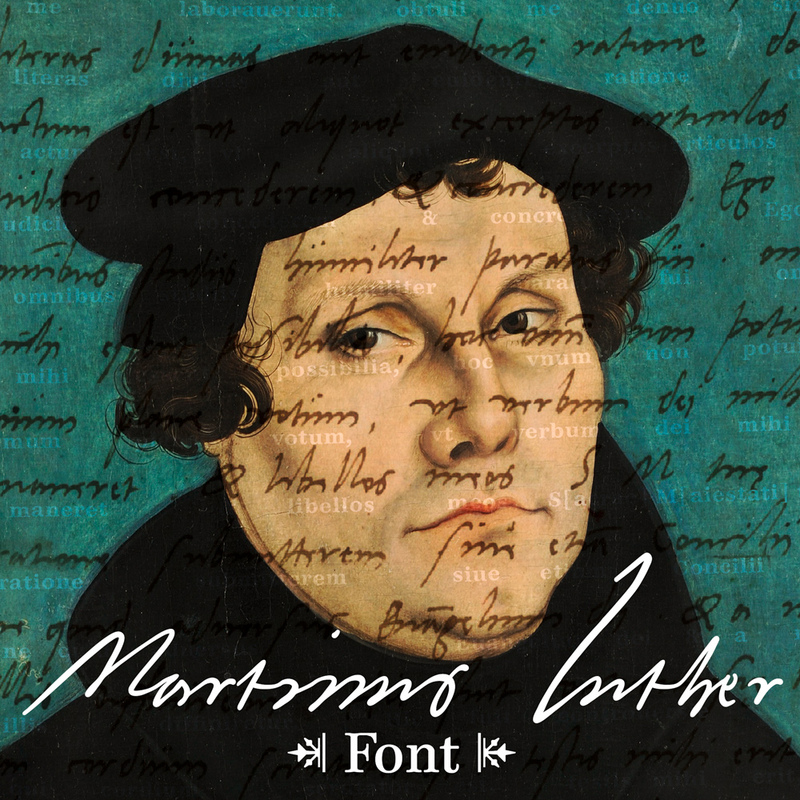 How did you have the idea to work on a Martin Luther font? A friend of mine gave it to me when he was visiting my Atelier. I think he saw Martin Luther King Jr. written on my board and he said that there was the 500 year celebration coming up in two years, for Martin Luther, and that I should do a font based on that. I decided it was a good idea to do both together–Martin Luther and Martin Luther King Jr. I thought it was something that people could also relate to. Kai Sohrmann. He is my oldest friend. I think I’ve know him since I was seven. He’s married to a priest and he wanted to become a priest himself, he is a social worker now. Both are Protestant. Hmmm. I think we are living in a culture in which religion is deeply ingrained. Therefor I think it is hard to be not religious. But, no, I don’t go to service. I grew up with religious input, in a liberal way. I was in a Catholic Kindergarten, but I was raised Protestant, and did summer camps supervised by the church. For me it is about encountering a historical figure and thinking about their writing in the time and context that they wrote—and then making the jump to today—what is different and what does it mean to use handwriting from the past. I was surprised to find out that many of my backers were Jewish. Because many of them were intellectuals, we had intelligent conversations about how they will continue to support my work, though they were not going to support the Martin Luther font. It crystallized in the process of talking with them that for me this work is more about encountering a historical figure rather than glorifying a person. When you make a font you said that you learn the movement of the person. What is the feeling of Martin Luther’s “hand” or movement when writing? Have you gained any insight to him, as a person or thinker? What is surprising is that it is very easy to use the computer methods to render Martin Luther’s handwriting movement, much easier than with Albert Einstein and Sigmund Freud. With Einstein and Freud I had to use three vector directions, and with Martin Luther I only had to use two. That was surprising to me. 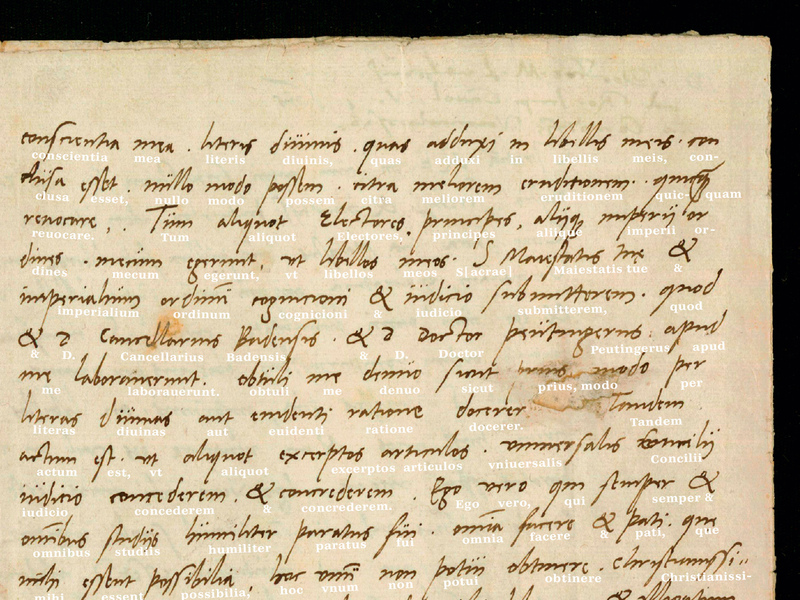 To think about Martin Luther’s handwriting, one has to keep in mind, that at the time, writing was an elite activity. It was also mainly a holy activity. In terms of the movement, it is a bit early in my research to say. Perhaps – It is very controlled. Very much about readability. And it’s a practice or craft, in which one can see characteristic distinctions from other handwriting at the time. One surely finds an expression of Luther in the handwriting, but the way to express oneself is of a quality, that I am still looking for words to describe. It might be about beauty or vanity connected with the expression of handwriting. I think the “vanity” has a different quality now and then. For example at the time all German intellectuals would latinise their names: Martin became Martinus. It was a hippster thing to do! I am reading The Swerve, right now (by Stephen Greenblatt). So I keep having in mind the images and the history of Medieval Europe. 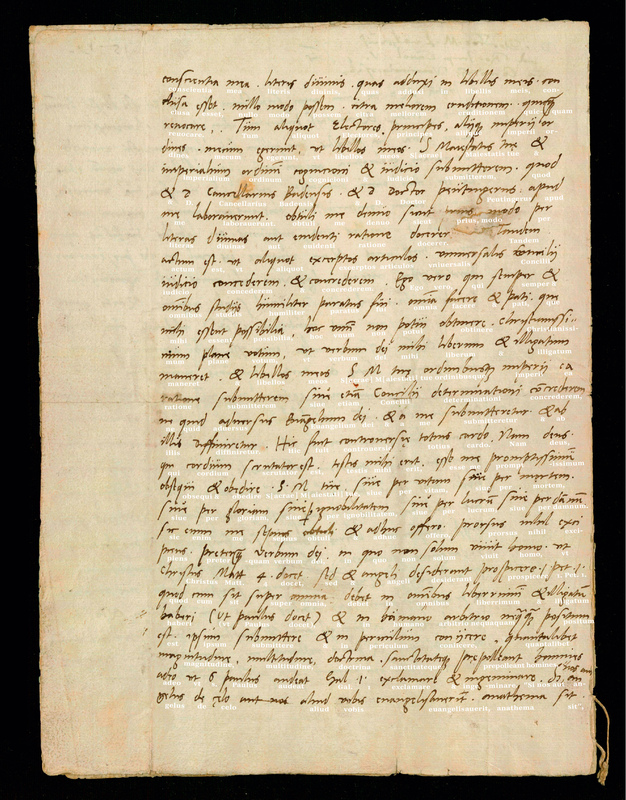 To produce the font I am looking at one specific document, a letter that was written after the trial of Martin Luther in 1521. I find it interesting to imagine what Martin Luther thought at the time, when he was writing that. Because what he later became, was different than what he was at the time. In 1521 he was not trying to divide the church. 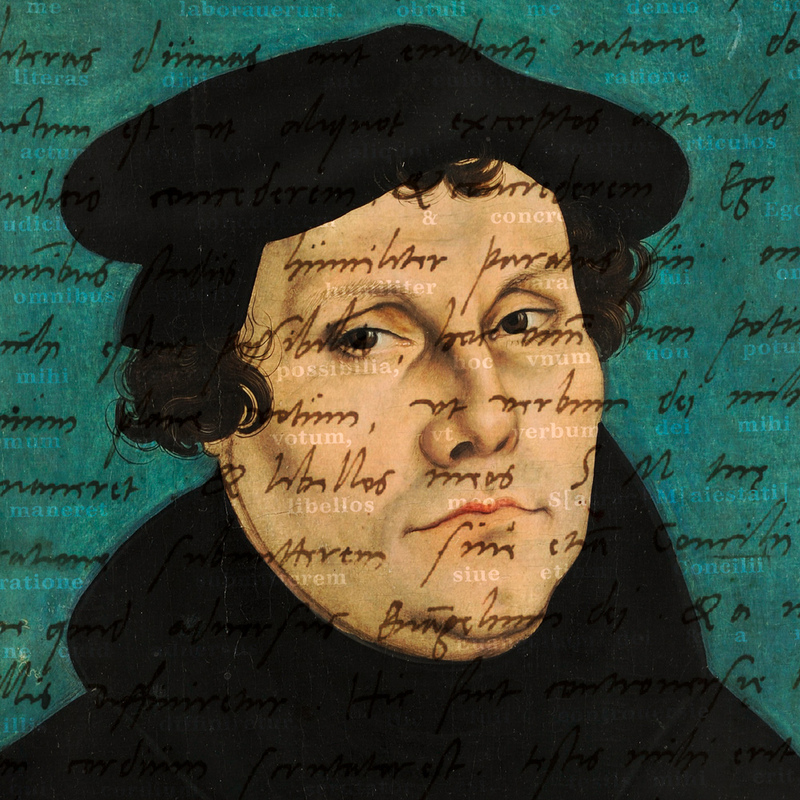 What differences do you see in how Martin Luther wrote compared to handwriting today? A lot of the rules that we take today for granted developed over time. For example, that after the period at the end of a sentence, that you start the next letter with a capital letter. That wasn’t the case always. So sometimes in Martin Luther’s writing, there is a period, and then the next sentence begins with a lower case. You mention that the letter h has changed. Are there any other differences? Many forms differ if they are writing in the beginning, middle or end of a word. For example the s is very different. Today I was looking at an American s, in a Speedball Textbook from 1960; there the s kind of has the form of a snake. The version of the s in Martin Luther’s handwriting is similar but a stretched out version of that movement top to bottom —it goes up, down next and then connects to the next letter, today we use just a squished together form (see Figure 1). There are more differences in the connections between letters, such as c and t in doctor. Those go down like a jump! That is not done today, for efficiency reasons. 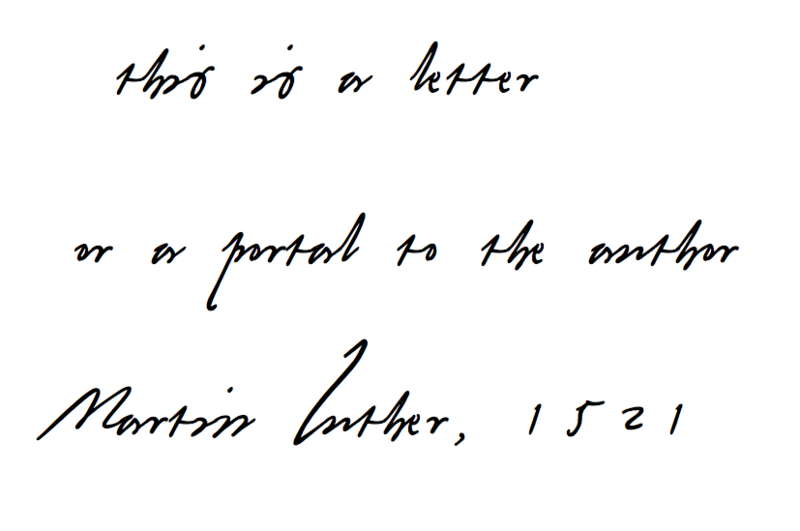 Also, in Martin Luther’s handwriting the e and the r almost never connect to the following letter; there is always a break in the flow. Today when you learn writing you always try and keep the flow. How might people use the Martin Luther font? I have no idea. My supporters always surprise me with how they use the fonts. Personally, maybe I would like to see Latin in it. I was surprised, when somebody said, it is a medieval handwriting project – which is true. In font design, everything goes back to the Latin letters. It might be that the Latin looks exceptionally good in it! When is the last day of the campaign? And how much is the cost of the font? The campaign runs until the 27th of December 2017 and is aiming to raise 20.000€. Backers that support the project with 10€ or more will receive the final font. If the campaign goal is not reached by the 27 December no backer will be charged. Figure 1: Letter from Martin Luther (1521) showing the long s and closing s, as well as the ct connection.